(CNN) The 41st President of the United States and patriarch of a political dynasty, George H.W. Bush died on Friday in Houston. He was 94 years old. 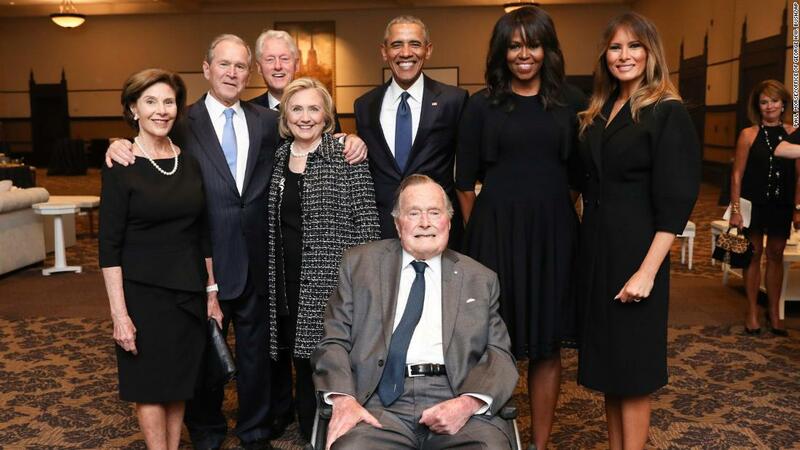 Friends, world leaders and fellow politicians are now paying tribute to the man remembered as a World War II combat pilot, a Cold War politician, and a compassionate family man. Through his essential authenticity, disarming wit, and unwavering commitment to faith, family, and country, President Bush inspired generations of his fellow Americans to public service — to be, in his words, “a thousand points of light” illuminating the greatness, hope, and opportunity of America to the world. Former President Barack Obama: America has lost a patriot and humble servant in George Herbert Walker Bush. While our hearts are heavy today, they are also filled with gratitude. Not merely for the years he spent as our forty-first President, but for the more than 70 years he spent in devoted service to the country he loved — from a decorated Naval aviator who nearly gave his life in World War II, to Commander-in-Chief of our Armed Forces, with plenty of posts along the way. Ambassador to the United Nations. Director of Central Intelligence. U.S. Envoy to China. Vice President of the United States. George H.W. Bush’s life is a testament to the notion that public service is a noble, joyous calling. And he did tremendous good along the journey. Expanding America’s promise to new immigrants and people with disabilities. Reducing the scourge of nuclear weapons and building a broad international coalition to expel a dictator from Kuwait. And when democratic revolutions bloomed across Eastern Europe, it was his steady, diplomatic hand that made possible an achievement once thought anything but — ending the Cold War without firing a shot. It’s a legacy of service that may never be matched, even though he’d want all of us to try. What a testament to the qualities that make this country great. Service to others. Commitment to leaving behind something better. Sacrifice in the name of lifting this country closer to its founding ideals. Our thoughts are with the entire Bush family tonight — and all who were inspired by George and Barbara’s example. Few Americans have been—or will ever be—able to match President Bush’s record of service to the United States and the joy he took every day from it; from his military service in World War II, to his work in Congress, the United Nations, China, the Central Intelligence Agency, the Vice Presidency and the Presidency, where he worked to move the post Cold War world toward greater unity, peace, and freedom. He never stopped serving. I saw it up close, working with him on tsunami relief in Asia and here at home after Hurricane Katrina. His remarkable leadership and great heart were always on full display. I am profoundly grateful for every minute I spent with President Bush and will always hold our friendship as one of my life’s greatest gifts. Our hearts and prayers are with George, Jeb, Neil, Marvin, Doro, their families, and the entire Bush clan. Ex-Soviet leader Mikhail Gorbachev: “I express my deep condolences to the family of George H.W. Bush and all Americans over of the death of the 41st president of the United States,” he told the Russian news agency Interfax. Gorbachev and Bush worked closely to help end to the Cold War. “I have a lot of memories associated with this person. We had a chance to work together during the years of tremendous changes. It was a dramatic time that demanded great responsibility from everyone. The result was an end to the Cold War and the nuclear arms race,” Gorbachev added. “I pay tribute to the contribution of George H. W. Bush to this historic achievement. He was a real partner,” he said. Prime Minister of Great Britain Theresa May: “Today Britain remembers a great statesman and a true friend of our country. We send our deepest condolences to the American people and to the family he leaves behind,” the Prime Minister said Saturday. Australian Prime Minister John Howard: George Herbert Walker Bush, 41st president of the United States, was in office when arguably the most momentous event in post Second World War affairs occurred – the collapse of the Communist empire of the Soviet Union. I extend my deep sympathy to the late President’s family. He exemplified the best of his nation’s values in both war and peace. Former California Governor Arnold Schwarzenegger: Today, we’ve lost a great hero. George Bush was an inspiration to all Americans and we will miss him dearly. From the day he first put on his US Navy flight suit and took off into the unknown, he always put his country first. He took on many jobs throughout his long career, and all shared one distinct trait: public service. His greatest legacy is that pure American spirit, that commitment to selflessness that drove him until the very end. I will always be grateful to him for his friendship, for embracing me and imparting just a fraction of his wisdom during our time together. Some of my fondest memories are of sledding with him at Camp David and inspiring America to join our fitness crusade by hosting the Great American Workout with him on the White House lawn and listening to his speech advice as we flew between campaign rallies. I will never forget the pride I felt the day he appointed me Chairman of the President’s Council on Physical Fitness and Sports. I loved to hear him surprise people with his wild side — explaining the pure joy he felt as he flew and jumped out of planes. I also loved to hear him explain his passion for this country — it was a true love that knew no petty boundaries or party lines. He taught me so much, but most of all, he taught me the power of serving a cause greater than yourself. I count myself lucky for many reasons; but for the opportunity to call George Bush a mentor, I can’t help but think I’m the luckiest man in America. President Bush has left us for one last flight but his destination isn’t unknown. He’s flying into the arms of the love of his life, Barbara. This evening, each of us should take a minute to look up and offer him a silent thanks. Former President Richard Nixon’s daughters Tricia Nixon Cox and Julie Nixon Eisenhower: Our father believed in George H.W. Bush. Richard Nixon kicked off George Bush’s campaign for congress in 1966, encouraged him to run for senate in 1970, entrusted him as U.N. Ambassador and head of the RNC, and supported him tirelessly when he served as President for four years. George H.W. Bush lived a life that was purposeful, and extraordinarily rewarding—for our nation, and for our world. Former Vice President Joe Biden: From the moment he signed up as an 18-year-old Naval aviator a few months after Pearl Harbor and for every step after that in his lengthy career as a diplomat, Congressman, Vice President, and President — George H.W. Bush chose a path of service. My thoughts and prayers are with President Bush’s family and the American people. George H. W. Bush’s lifetime of service began when he enlisted during the Second World War and became one of the youngest pilots in the U.S. Navy. His exemplary spirit of service and commitment to country would mark each of his roles — including in Congress, as ambassador to the United Nations, as head of the Central Intelligence Agency, and in the White House. Today, all Canadians join our American friends and neighbours in mourning the loss of a great leader and friend. George H. W. Bush’s lifetime of public service has inspired a thousand points of light. His legacy will inspire many more. Israeli Prime Minister Benjamin Netanyahu: On behalf of the people of Israel I send heartfelt condolences to the Bush family and the American People on the passing of a great American patriot, President George H.W. Bush. His wise leadership at the end of the Cold War helped steer the world to a peaceful transition and the spread of democracy. The People of Israel will always remember his commitment to Israel’s security, his important contribution to the liberation of Soviet Jewry, and his efforts to achieve peace in the Middle East at the Madrid Conference. President Bush’s legacy is deep and broad: the many people that he touched, the difference that he made in the life of the country and the impact that he had beyond America’s shores. We will never forget his steady and inspired leadership in guiding the world to the peaceful end of the Cold War. Now he is in God’s loving embrace with Mrs. Barbara Bush, his beloved wife of so many years. He has finished his race with honor and dignity. All who knew him and loved him — especially his remarkable family — will miss him. Yet, he lives on with us in spirit. Rest well, Mr. President. Republican National Committee: President Bush dedicated himself to serving his country in many roles: a naval aviator, a congressman, an ambassador, RNC chairman, CIA director, vice president, and commander in chief. He stood for American strength and cared deeply for the American people, alongside his late wife Barbara. President Bush’s legacy of bold leadership, patriotism and humanitarianism will live on long after his passing. 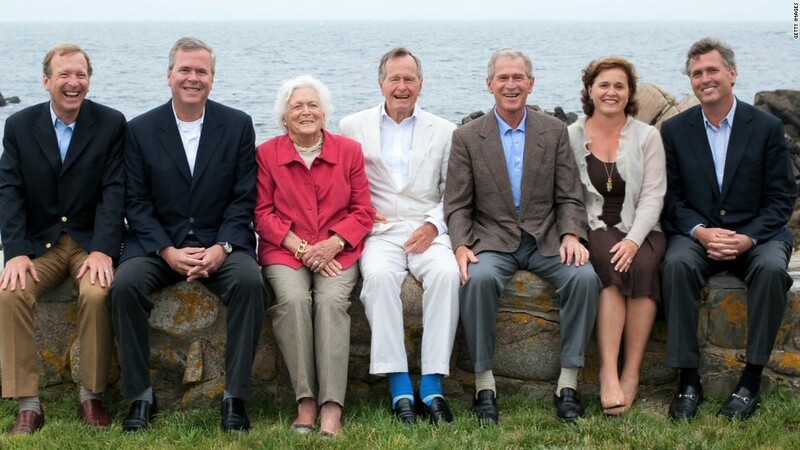 We at the RNC are praying for the entire Bush family. Houston Mayor Sylvester Turner: George H.W. Bush served with valor and integrity as the 41st president of the United States. But to Houstonians he was one of our most esteemed and relatable neighbors. He and his wife Barbara Bush were our sports teams’ biggest fans, and boosters for everything Houston. The Bushes could have moved anywhere after his time in public office, but they chose to return to their beloved city where he started his political career as the chair of the Harris County Republican Party. “In statesman-like fashion, he knew the importance of reaching across the aisle to find common ground. He backed our bid to host the 2020 Democratic National Convention. He was an equal ally of former election foe President Bill Clinton in helping victims of Hurricane Harvey and Hurricane Irma through the One America Appeal. 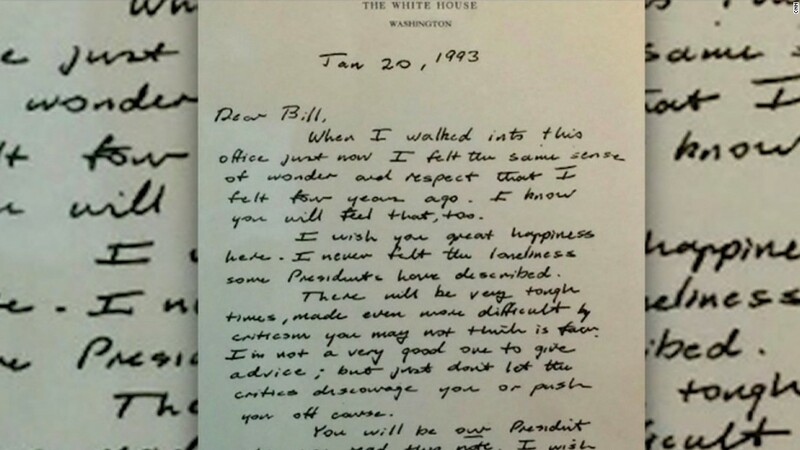 And I will always be grateful to the Bushes for being kind friends and advisers to me. Apple CEO Tim Cook: We have lost a great American. Service defined President George H.W. Bush’s life, and he taught all of us about leadership, sacrifice and decency. We send our deepest sympathies to the Bush family.